WeiBonD 8 Holds 5 Inch Sanding Discs is made from durable aluminum oxide grain, suitable for cleaning and polishing. 8 Holes sandpapers are suitable for sanding at high speeds, the round sanding sheet can use for many purposes. Easy to install, remove and clean. Apply to metal and non-metal, wood, rubber, leather, plastic, stone, glass and other materials grinding, polishing, etc. Mainly applicable to beads, wooden bead polishing, Burnish walls, furniture, cars, boats and other industry of metallic and non-metallic materials, with the exception of paint, in addition to grinding burrs, solder joint. If for any reason you are not satisfied we offer a NO QUESTIONS ASKED FULL REFUND policy. If you have lot of wood work of furniture or other project to making them smooth and shiner, 6 different grits sandpaper assortment are great for you. Made from aluminium oxide abrasive, durable, anti-static and anti-clogging, apply to metal and non-metal, wood, rubber, leather, plastic, stone and other materials grinding, polishing. Hook and loop sandpaper backing ( velcro back ) makes grit install and remove very easy, lengthens the life of the abrasive. Our sanding discs fit your orbital sander, including the DeWalt DW421, DW423, 5-inch Ryobi, Bosch 3107, 3725, Makita B05010, and Ridgid R26011, among others. 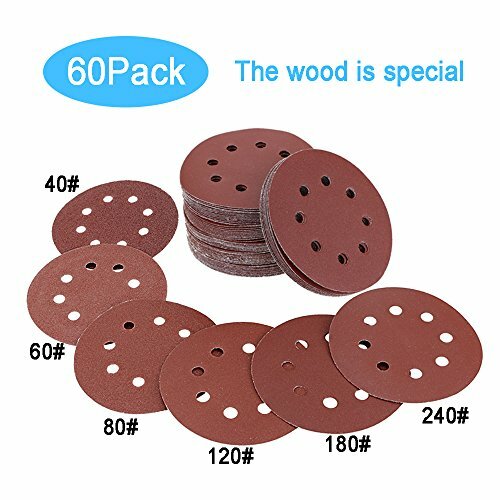 Package includes 60 pieces sandpaper, 10 pieces of each grit: 40/ 60/ 80/ 120/ 180/ 240. The grit is larger, the polish effect is more obvious. If you have any questions about this product by WeiBonD, contact us by completing and submitting the form below. If you are looking for a specif part number, please include it with your message. Blackstone Silicone Grindstone Tormek SB-250. The Silicone Blackstone Sharpener That’s Specifically Made for High-Speed and Exotic Alloy Steels. Fits Tormek Sharpening Systems T-7 and SuperGrind 2000. Lenox Tools 1972924 METALMAX Diamond Edge Cutoff Wheel, 7" x 7/8"
Lenox Tools 1972918 METALMAX Diamond Edge Cutoff Wheel, 3" x 3/8"
Blastrac CG-1020GTP Concrete General Purpose Premium Blade, 25/30 Grit, 10"